There is plenty to see in the sky this week. On the evening of 16 November, Mars and the moon will wheel across the southern sky. The moon will be in a waxing gibbous phase, with about 60% of its disc illuminated. The pair will be in the constellation Aquarius. Next morning, a glittering duo will be visible as they rise above the eastern horizon just before dawn. The planet Venus will meet Spica in the constellation of Virgo. Spica is one of the 20 brightest stars in the sky, and was possibly worshiped by the ancient Minoans, yet it will be totally outshone by Venus. The big event of the week is the Leonids meteor shower. It will peak on the night of 17-18 November between midnight and dawn. The Leonids tend to be fast-moving, bright streaks with peak rates of up to 20 per hour. They hit the Earth’s atmosphere at a speed of around 70km a second and appear to radiate from a point in the head of Leo, hence their name. 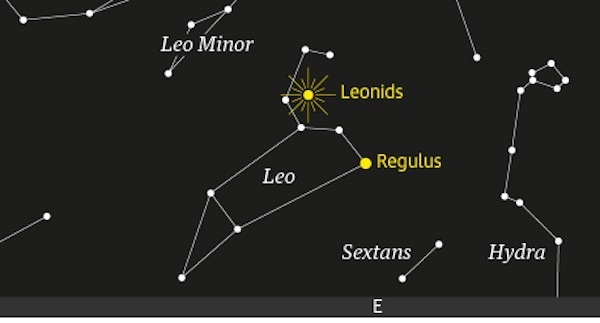 The chart shows the constellation Leo at 01:00 GMT on 18 November.